For a week or 2, I have this issue as well - I think it's caused by latest Nvidia video driver update, but not sure. I have a question: How to add railings or models to prefabs? Because I need crash barriers and lights on prefabs. If there is any automatic way to add? Okay, so I have recently been working on a standalone map. Today, instead of just going straight to the mapping, i decided to add the city definitions. However, when I loaded the map up the new cities weren't available and the background image wasn't there. I tried to takes some steps to fix this, but each time i did the game crashed upon opening the editor. I reverted back to the original issue before taking a copy of the log below, and have since then completely reversed all editing from today ( though kept a copy incase it is an easy fix). 00:00:00.000 : [cpu] CPU0: AuthenticAMD [AMD Athlon(tm) II X2 255 Processor] with 2 cores (2 threads) at ~3114MHz. 00:00:00.938 : [ufs] Home directory: 'C:/Users/Boys/Documents/Euro Truck Simulator 2'. 00:00:01.314 : [hashfs] dlc_east.scs: Unmounted. 00:00:02.039 : [hashfs] dlc_fr.scs: Unmounted. 00:00:02.221 : [hashfs] dlc_heavy_cargo.scs: Unmounted. 00:00:03.179 : [hashfs] dlc_it.scs: Unmounted. 00:00:04.398 : [hashfs] dlc_north.scs: Unmounted. 00:00:04.678 : [hashfs] dlc_oversize.scs: Unmounted. 00:00:04.746 : [hashfs] dlc_rims.scs: Unmounted. 00:00:04.750 : [hashfs] dlc_rocket_league.scs: Unmounted. 00:00:04.786 : [hashfs] dlc_toys.scs: Unmounted. 00:00:04.938 : [hashfs] dlc_trailers.scs: Unmounted. 00:00:04.990 : <WARNING> [mod] Mod package 'def' does not contain a manifest file 'manifest.sii', creating default information set. 00:00:05.038 : <WARNING> [mod] Mod package 'LandOfTrucks' does not contain a manifest file 'manifest.sii', creating default information set. 00:00:05.123 : <WARNING> [mod] Mod package 'PerthTruckSim' does not contain a manifest file 'manifest.sii', creating default information set. 00:00:05.512 : [mod_package_manager] Requesting Steam Workshop content..
00:00:05.515 : uset r_full_resolution_corrections "0"
00:00:05.515 : uset g_mm_help_shown "1"
00:00:05.515 : uset g_save_indicator "1"
00:00:05.515 : uset g_game_version "1.33.2.19"
00:00:05.515 : uset g_force_online_lscrs "0"
00:00:05.515 : uset g_frame_image_fmt "jpg"
00:00:05.515 : uset g_frames_path ""
00:00:05.515 : uset g_hw_info "1"
00:00:05.515 : uset g_glass_debugging_level "0"
00:00:05.515 : uset g_line_sort "0"
00:00:05.515 : uset g_cargo_sort "2"
00:00:05.515 : uset g_tooltip_delay "0.4"
00:00:05.515 : uset g_bloom_standard_deviation "0.5"
00:00:05.515 : uset g_bloom_filter_radius "6"
00:00:05.515 : uset g_bloom_resizing_steps "3"
00:00:05.515 : uset g_bloom_override "0"
00:00:05.515 : uset g_bloom "1.0"
00:00:05.515 : uset g_global_force_load_selector "0"
00:00:05.515 : uset g_desktop_fadeout "60"
00:00:05.515 : uset inst_flags "0"
00:00:05.515 : uset g_disable_hud_activation "0"
00:00:05.515 : uset r_wireframe "0"
00:00:05.515 : uset g_interior_camera_zero_pitch "0"
00:00:05.516 : uset r_multimon_exterior_in_aux "0"
00:00:05.516 : uset r_multimon_interior_in_main "1"
00:00:05.516 : uset r_multimon_rotation_aux "0"
00:00:05.516 : uset r_multimon_rotation_right "0"
00:00:05.516 : uset r_multimon_rotation_left "0"
00:00:05.516 : uset r_multimon_rotation_center "0"
00:00:05.516 : uset r_multimon_vert_offset_right "0"
00:00:05.516 : uset r_multimon_vert_offset_left "0"
00:00:05.516 : uset r_multimon_border_fov_right "0"
00:00:05.516 : uset r_multimon_border_fov_left "0"
00:00:05.516 : uset r_multimon_fov_vertical "0"
00:00:05.516 : uset r_multimon_fov_horizontal "50"
00:00:05.516 : uset r_multimon_mode "0"
00:00:05.516 : uset r_use_depth_bounds "1"
00:00:05.516 : uset r_show_light_pixel_coverage "0"
00:00:05.516 : uset r_buffer_page_size "10"
00:00:05.516 : uset r_deferred_debug "0"
00:00:05.516 : uset r_mirror_scale_y "1"
00:00:05.516 : uset r_mirror_scale_x "1"
00:00:05.516 : uset r_scale_y "0.75"
00:00:05.516 : uset r_scale_x "0.75"
00:00:05.516 : uset r_normal_maps "0"
00:00:05.516 : uset r_sunshafts "0"
00:00:05.516 : uset r_color_saturation "1.0"
00:00:05.516 : uset r_color_yellow_blue "0.0"
00:00:05.516 : uset r_color_magenta_green "0.0"
00:00:05.516 : uset r_color_cyan_red "0.0"
00:00:05.516 : uset r_color_correction "0"
00:00:05.516 : uset r_cloud_shadows "1"
00:00:05.516 : uset r_dof_filter_size "0.5"
00:00:05.516 : uset r_dof_transition "400.0"
00:00:05.516 : uset r_dof_start "200.0"
00:00:05.516 : uset r_dof "0"
00:00:05.516 : uset r_mlaa_threshold "1.0"
00:00:05.516 : uset r_mlaa "0"
00:00:05.516 : uset r_hdr "0"
00:00:05.516 : uset r_fake_shadows "1"
00:00:05.516 : uset r_sun_shadow_texture_size "2048"
00:00:05.516 : uset r_sun_shadow_quality "0"
00:00:05.516 : uset r_mirror_group "3"
00:00:05.516 : uset r_mirror_view_distance "80"
00:00:05.517 : uset r_deferred_mirrors "0"
00:00:05.517 : uset r_deferred "1"
00:00:05.517 : uset r_nowmi "0"
00:00:05.517 : uset r_startup_progress "0"
00:00:05.517 : uset r_setup_done "1"
00:00:05.517 : uset r_gamma "1.0"
00:00:05.517 : uset r_manual_stereo_buffer_scale "1.0"
00:00:05.517 : uset r_manual_stereo_ui_fov_game "100"
00:00:05.517 : uset r_manual_stereo_ui_fov "80"
00:00:05.517 : uset r_manual_stereo_ui_dist_game "0.5"
00:00:05.517 : uset r_manual_stereo_ui_dist "0.8"
00:00:05.517 : uset r_manual_stereo_in_menu "0"
00:00:05.517 : uset r_nv_stereo_mode "2"
00:00:05.517 : uset r_minimal_unfinished_frames "0"
00:00:05.517 : uset r_no_frame_tracking "0"
00:00:05.517 : uset r_msaa "0"
00:00:05.517 : uset r_fullscreen "1"
00:00:05.517 : uset r_mode_refresh "0"
00:00:05.517 : uset r_mode_height "1080"
00:00:05.517 : uset r_mode_width "1920"
00:00:05.517 : uset r_path ""
00:00:05.517 : uset r_device "dx9"
00:00:05.517 : uset i_virtual_cursor_speed "500.0"
00:00:05.517 : uset g_trackir "1"
00:00:05.517 : uset g_lod_factor_pedestrian "1"
00:00:05.517 : uset g_pedestrian "0"
00:00:05.517 : uset g_light_span_factor "0"
00:00:05.517 : uset g_light_distance_factor "0"
00:00:05.517 : uset g_vehicle_flare_lights "0"
00:00:05.517 : uset g_auto_traffic_headlights "0"
00:00:05.517 : uset g_lod_factor_parked "1"
00:00:05.517 : uset g_lod_factor_traffic "1"
00:00:05.517 : uset g_traffic "1.0"
00:00:05.517 : uset g_kdop_preview "0"
00:00:05.517 : uset g_screenshot_on_bug_quality "100"
00:00:05.517 : uset g_screenshot_on_bug "0"
00:00:05.517 : uset g_shoulder_block_coloring "0"
00:00:05.517 : uset g_debug_map_limits "0"
00:00:05.517 : uset g_city_name_move "0"
00:00:05.517 : uset g_developer "1"
00:00:05.517 : uset g_steam_rich_presence "1"
00:00:05.517 : uset g_steam_browser "1"
00:00:05.518 : uset g_steam_screenshots "2"
00:00:05.518 : uset g_artist_id "0"
00:00:05.518 : uset g_save_format "0"
00:00:05.518 : uset g_trailer_cables_mode "0"
00:00:05.518 : uset g_spec_trans_refill_tank "1"
00:00:05.518 : uset g_flyspeed "11"
00:00:05.518 : uset g_online_loading_screens "1"
00:00:05.518 : uset g_news "1"
00:00:05.518 : uset g_colbox "0"
00:00:05.518 : uset g_radio_mode "2"
00:00:05.518 : uset g_ignore_low_fps "0"
00:00:05.518 : uset g_truck_light_quality "1"
00:00:05.518 : uset g_truck_light_specular "1"
00:00:05.518 : uset g_gfx_all_scales "0"
00:00:05.518 : uset g_gfx_advanced "1"
00:00:05.518 : uset g_gfx_quality "-1"
00:00:05.518 : uset g_hq_3d_scale "0.0"
00:00:05.518 : uset g_hq_3d_screenshot "0"
00:00:05.518 : uset g_menu_aa_limit "8"
00:00:05.518 : uset g_additional_water_fov "20.0f"
00:00:05.518 : uset g_rain_reflect_hookups "0"
00:00:05.518 : uset g_rain_reflect_actor "0"
00:00:05.518 : uset g_rain_reflect_traffic "0"
00:00:05.518 : uset g_rain_reflect_cache "0"
00:00:05.518 : uset g_rain_reflection "0"
00:00:05.518 : uset g_reflection "0"
00:00:05.518 : uset g_grass_density "0"
00:00:05.518 : uset g_veg_detail "0"
00:00:05.518 : uset g_minicon "0"
00:00:05.518 : uset g_console "1"
00:00:05.518 : uset g_texture_usage_stats "0"
00:00:05.518 : uset g_fps "0"
00:00:05.518 : uset g_stream_exts ".ogg;.mp3"
00:00:05.518 : uset r_vsync "1"
00:00:05.518 : uset r_anisotropy_factor "0"
00:00:05.518 : uset r_texture_detail "2"
00:00:05.518 : uset t_locked_fps "0"
00:00:05.518 : uset t_averaging_window_length "20"
00:00:06.032 : [dx9] Direct3D9Ex detected. 00:00:06.113 : [dx9] Using adapter #0. 00:00:06.320 : [dx9] SLI not found. 00:00:06.320 : [dx9] Stereo fully allowed. 00:00:06.322 : [dx9] D3D9 device sucessfully created. 00:00:29.494 : uset s_sfx_volume "1.0"
00:00:29.494 : uset s_radio_volume "0.532895"
00:00:29.494 : uset s_music_volume "0.8"
00:00:29.494 : uset s_master_volume "1.0"
00:00:29.494 : uset s_reverse_stereo "0"
00:00:29.494 : uset g_force_economy_reset "0"
00:00:29.494 : uset g_input_configured "1"
00:00:29.494 : uset i_oculus_eye_protrusion "0.09"
00:00:29.494 : uset i_oculus_eye_height "0.15"
00:00:29.494 : uset i_hmd_max_prediction "0.1"
00:00:29.494 : uset i_hmd_min_prediction "0.0"
00:00:29.494 : uset r_interior "1"
00:00:29.494 : uset r_steering_wheel "1"
00:00:29.494 : uset g_toy_physics "1"
00:00:29.494 : uset g_cam_steering_reverse "1.0"
00:00:29.494 : uset g_cam_steering_value "1.0"
00:00:29.494 : uset g_cam_steering "0"
00:00:29.494 : uset g_pedal_clutch_range "1.0"
00:00:29.495 : uset g_brake_intensity "3"
00:00:29.495 : uset g_steer_autocenter "1"
00:00:29.495 : uset g_hshifter_synchronized "1"
00:00:29.495 : uset g_hshifter_split "3"
00:00:29.495 : uset g_hshifter_layout_shifting "1"
00:00:29.495 : uset g_hshifter_layout "splitter"
00:00:29.495 : uset g_baked_vehicle "1"
00:00:29.496 : uset s_sfx_enabled "1"
00:00:29.496 : uset s_music_enabled "1"
00:00:29.496 : uset g_cargo_load_require_park_brake "0"
00:00:29.496 : uset g_cargo_load_require_engine_off "1"
00:00:29.496 : uset g_last_wotr_event_id "0"
00:00:29.496 : uset g_force_load_selector "0"
00:00:29.496 : uset g_autoload_ignore_autosave "0"
00:00:29.496 : uset g_start_in_truck "0"
00:00:29.496 : uset g_park_brake_init "1"
00:00:29.496 : uset g_trailer_advanced_coupling "0"
00:00:29.496 : uset g_parking_difficulty "0"
00:00:29.496 : uset g_simple_parking_doubles "1"
00:00:29.496 : uset g_job_distance "1.0"
00:00:29.496 : uset g_job_distance_limit "-1.0"
00:00:29.496 : uset g_income_factor "1.0"
00:00:29.496 : uset g_currency "0"
00:00:29.496 : uset g_bad_weather_factor "0.32"
00:00:29.496 : uset g_truck_analysis_fold "0"
00:00:29.496 : uset g_desktop_rnd "0"
00:00:29.496 : uset g_desktop_bcg "config"
00:00:29.496 : uset g_save_idx "1"
00:00:29.496 : uset g_ui_map_align "1"
00:00:29.496 : uset g_gps_routing_mode "0"
00:00:29.496 : uset g_gps_navigation "3"
00:00:29.496 : uset g_heavy_cargo_popup "1"
00:00:29.496 : uset g_adviser_auto_parking "1"
00:00:29.496 : uset g_adviser_keep_hidden "0"
00:00:29.496 : uset g_adviser "1"
00:00:29.496 : uset g_desktop_tutorial "1"
00:00:29.496 : uset g_tutorial "1"
00:00:29.496 : uset g_fatigue "1"
00:00:29.496 : uset g_time_zones "0"
00:00:29.496 : uset g_police "1"
00:00:29.496 : uset g_subtitles "0"
00:00:29.497 : uset g_clock_24 "1"
00:00:29.497 : uset g_disable_beacons "0"
00:00:29.497 : uset g_show_game_elements "1"
00:00:29.497 : uset g_hmd_no_3d_background "0"
00:00:29.497 : uset g_hmd_no_special_menu "0"
00:00:29.497 : uset g_hmd_reduced_cabin_movement "1"
00:00:29.497 : uset g_hmd_no_artifical_movement "0"
00:00:29.497 : uset s_interior_volume "1.0"
00:00:29.497 : uset s_wheel_noise "1.0"
00:00:29.497 : uset s_air_noise "1.0"
00:00:29.497 : uset s_rumble_enabled "1"
00:00:29.497 : uset s_reverse_enabled "1"
00:00:29.497 : uset g_cam_blinker "0"
00:00:29.497 : uset g_cam_physics_value "1.0"
00:00:29.497 : uset g_cam_physics "1"
00:00:29.497 : uset g_blinker_auto_off "1"
00:00:29.497 : uset g_cruise_control_smart "5.0"
00:00:29.497 : uset g_cruise_control_grid "5.0"
00:00:29.497 : uset g_adaptive_shift "0.0"
00:00:29.497 : uset g_fuel_simulation "0"
00:00:29.497 : uset g_hardcore_simulation "0"
00:00:29.497 : uset g_reg_setting "reg_setting.europe"
00:00:29.497 : uset g_brake_light_all "0"
00:00:29.497 : uset g_use_speed_limiter "1"
00:00:29.497 : uset g_hud_speed_warning "0"
00:00:29.497 : uset g_hud_speed_limit "1"
00:00:29.497 : uset g_axle_drop_auto "1"
00:00:29.497 : uset g_engine_start_auto "1"
00:00:29.497 : uset g_motor_brake_auto "0"
00:00:29.497 : uset g_retarder_auto "0"
00:00:29.497 : uset g_suspension_stiffness "1.0"
00:00:29.497 : uset g_trailer_stability "1"
00:00:29.497 : uset g_truck_stability "0.5"
00:00:29.497 : uset g_mpg "0"
00:00:29.497 : uset g_gallon "0"
00:00:29.497 : uset g_fahrenheit "0"
00:00:29.497 : uset g_pounds "kg"
00:00:29.497 : uset g_mph "0"
00:00:29.497 : uset g_trans "0"
00:00:29.497 : uset g_road_events "3"
00:00:29.497 : uset g_detours "1.0"
00:00:29.497 : uset g_name_localization "0"
00:00:29.497 : uset g_lang_set "1"
00:00:29.498 : uset g_lang "en_us"
00:00:29.498 : uset g_cutscenes "1"
00:00:29.498 : uset g_phys_mirrors "0"
00:01:23.004 : Map base sectors successfully loaded. 00:01:23.046 : Building kdop tree for all sectors. 00:01:23.046 : Sectors' trees finished. 00:01:23.487 : [dx9] SLI not found. 00:01:23.487 : [dx9] Stereo fully allowed. 00:01:23.488 : [dx9] D3D9 device sucessfully created. 00:01:23.523 : <WARNING> [di8] Can not set cooperative level for device 'keyboard' (error code: 0x80070006). 00:01:23.524 : <WARNING> [di8] Can not set cooperative level for device 'mouse' (error code: 0x80070006). 00:01:25.157 : [dx9] SLI not found. 00:01:25.157 : [dx9] Stereo fully allowed. 00:01:25.158 : [dx9] D3D9 device sucessfully created. 00:01:25.172 : <WARNING> [di8] Can not set cooperative level for device 'keyboard' (error code: 0x80070006). 00:01:25.172 : <WARNING> [di8] Can not set cooperative level for device 'mouse' (error code: 0x80070006). 00:02:25.287 : Building kdop tree for all sectors. 00:02:25.287 : Sectors' trees finished. 00:02:32.370 : Building kdop tree for all sectors. 00:02:32.370 : Sectors' trees finished. 00:02:36.506 : Building kdop tree for all sectors. 00:02:36.506 : Sectors' trees finished. 00:02:51.333 : Building kdop tree for all sectors. 00:02:51.333 : Sectors' trees finished. 00:03:13.209 : [dx9] SLI not found. 00:03:13.211 : [dx9] Stereo fully allowed. 00:03:13.211 : [dx9] D3D9 device sucessfully created. 00:03:14.015 : [hashfs] dlc_east.scs: Unmounted. 00:03:14.015 : [hashfs] dlc_trailers.scs: Unmounted. 00:03:14.015 : [hashfs] dlc_toys.scs: Unmounted. 00:03:14.015 : [hashfs] dlc_rocket_league.scs: Unmounted. 00:03:14.016 : [hashfs] dlc_rims.scs: Unmounted. 00:03:14.016 : [hashfs] dlc_oversize.scs: Unmounted. 00:03:14.016 : [hashfs] dlc_north.scs: Unmounted. 00:03:14.016 : [hashfs] dlc_it.scs: Unmounted. 00:03:14.016 : [hashfs] dlc_heavy_cargo.scs: Unmounted. 00:03:14.016 : [hashfs] dlc_fr.scs: Unmounted. 00:03:15.306 : [hashfs] core.scs: Unmounted. 00:03:15.306 : [hashfs] def.scs: Unmounted. 00:03:15.307 : [hashfs] locale.scs: Unmounted. 00:03:15.307 : [hashfs] base_cfg.scs: Unmounted. 00:03:15.307 : [hashfs] base.scs: Unmounted. 00:03:15.307 : [hashfs] effect.scs: Unmounted. 00:03:15.368 : [sys] Process manager shutdown. Sorry its a bit long, it was 630 000 characters over the limit for this post, though it looks quite repetitive. 00:01:19.362 : <WARNING> Ignoring obsolete attribute 'price_coef' of unit 'cargo.boat_jth' (of type 'cargo_data'). 00:01:19.545 : <WARNING> Ignoring obsolete attribute 'mass' of unit '.chem_20ft11j' (of type 'trailer_def'). 00:01:19.545 : <WARNING> Ignoring obsolete attribute 'cog_offset' of unit '.chem_20ft11j' (of type 'trailer_def'). That seemed to repeat for most of the cargoes. I hope someone can make more sense of it than me, and explain what is wrong. Currently working on a PerthTruckSim, a 1:1 representation of Perth, WA. for all those who are interested, that log was 11,292 lines long. City definitions come in two files: a file in def/city with the specific city name, and an entry in the city. (modname).sii file. With the city file, make sure the file name doesn't exceed 12 characters (you can write out the full name in the file, look at some longer city name files for an example). If both of these are done correctly, the city should appear. Looks like one of them is for the UK. 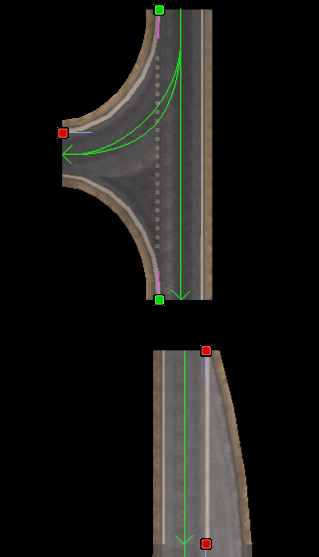 Have this junction https://i.imgur.com/wIZY5hP.png when testing the AI paths around junction and roundabout using traffic tool the pathing for junction is there for both ways but no pathing going roundabout from junction and get this error in console https://i.imgur.com/kdNmU0q.png any ideas what it means/referring to?